The world comes alive when Spring decides to grace us with her presence. Mother Nature awakes from her slumber and shows us all that she has to offer by gracing us with beautiful flowers, budding trees and singing birds. Celebrate the changing of seasons with a Spring inspired cross stitch pattern. Enjoy these projects not just now, but all year round. When Spring arrives, you will know it by a bird's song. It could be the chirp of a robin, or a peep of a baby chick. Celebrate the return of our feathered friends with this Spring Beauty cross stitch pattern by ThuHa Design. You can stitch it as an entire hoop or individual projects. Looking for a more traditional way to celebrate the season? Download this free Floral Basket pattern by Alice Okon. You can change the color scheme to fit your decor. It would be a beautiful addition to a formal dining room or sun room. What words come to mind when you think of Spring? Flowers? Bunnies? Birds? Fresh Air? Stitchery Stitch created a Signs of Spring pattern that includes every happy word that is associated with Spring. This project would be wonderful on a mantle with fresh cut daffodils. Share your love of Spring with a bright and fun Happy Bird card courtsey of Alioka. This pattern is free to download from her blog and can be used not only for cards but also small framed samplers. Spring is the perfect time for a makeover. Even little sheep need a new hairdo to welcome the season. Just a little off the top, please! MadameChantillyxxx's Spring Makeoverpattern is a great mix of primitive and whimsical design. Russian nesting dolls come in a variety of styles and themes. The Tiny Modernist shares her version with a free Spring Matroyshka pattern. This can not only be stitched up for spring, but also for Valentine's Day. 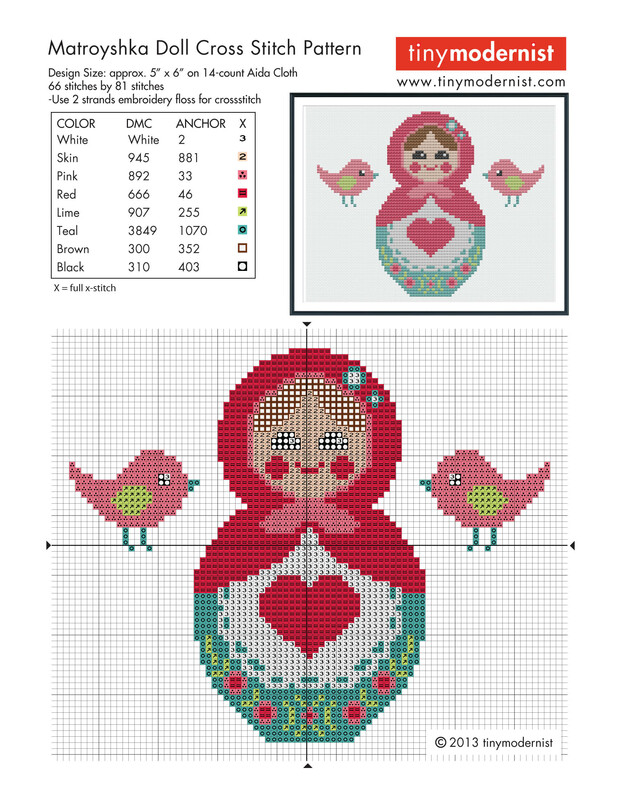 It is like getting two free patterns in one, just like a nesting doll! Chalkboard themed cross stitch patterns are very popular. The white floss really pops against the grey fabric. There are other season and holiday themed patterns to accompany the Spring Chalkboard project. Make one for each season to hang on your door or mantle. We wait, and wait and wait and finally POP! Spring is here! These cute little chicks are perfect for expressing our feelings of Spring. This pattern is free to download and can be stitched in a variety of colors. This pattern would make a great baby shower gift. It doesn't matter if you have a great voice or not, spring is here and it is time to shout it from the roof tops, or the bird cage as it is, with this Singing in the Spring cross stitch pattern. This pattern will lift spirits and be a colorful addition to anyone's decor. This Daffodil Sampler is the perfect mix of traditional flowers with a modern font. It is free for download from DMC UK and can be customized in any color of your choosing. Spreading her wings and taking to the Spring skies, this Lavender Spring Garden Pixie makes the most out of the season. Use iridescent floss to make her wings sparkle in the sunlight. This is one in a series of garden pixie patterns. Get loud with your stitching with this free Spring pattern from The World According to Agi. If orange isn't your thing, change up the colors. You can also mix up the surrounding patterns to whatever images you like. If you can't decide what aspect of Spring you love, why not stitch them all with this cute kawaii inspired cross stitch pattern from The Frosted Pumpkin. Their Spring Sampler has something for everyone.You can stitch one pattern or individual projects. Create a spring inspired gift with this pattern for a Floral Biscornu. If you do not want to make a pincushion, why not stitch a handkerchief or a sachet full of lavender or roses. 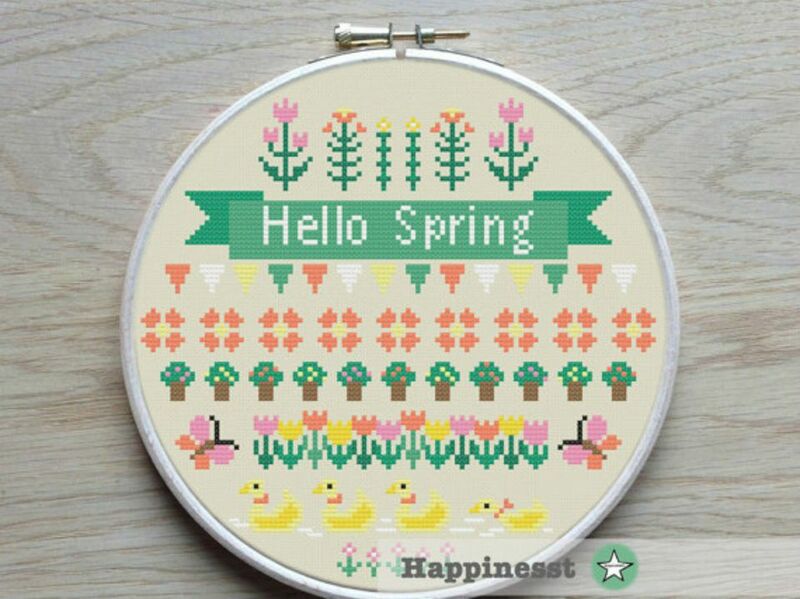 Say Hello to Spring with this colorful Spring sampler from Happinesst. The bright colors and fun flowers welcome the new season. If you want to, dissect this pattern and use the lines of flowers as a border for other projects. Celebrating Spring is as easy as ABC with this free Sample of Spring pattern. This project has it all, including a quilt inspired pattern in the middle. You can stitch it as one or separate it to make several patterns. Everyone knows that April showers bring May flowers. A little rain must fall in order to make spring flowers bloom. Don't run and hide, have fun and dance in the rain! When you can't get out and dance, stitch up some liquid sunshine with this Spring Umbrella inspired pattern. Merci, Gracia, Thank You. We should all be thankful for what and who we have in our lives. Let them know you appreciate them with this free Spring Merci cross stitch pattern. Do you need a gentle reminder to have a good day? We all need that extra little love sometimes. Stitch up the Spring inspired Have a Nice Day cross stitch pattern to remind yourself that life is good and to enjoy the happiness around you; like flowers, and fun cross stitch! If you don't have a green thumb but love spring flowers, don't give up hope; stitch them instead! This free Spring Tulip cross stitch pattern is a pretty way to have flowers all year long. You can customize the colors to fit your liking. This stunning Spring Goddesspattern looks more like a pattern then a cross stitch pattern. It is a lot of work but well worth the time. Better get started now! Rainy Days are perfect for staying inside and stitching. Every drop that falls, your flowers drink them in and prepare to bloom. Celebrate thos rain drops with this free pattern. Spring isn't all about flowers and raindrops. It is about you emerging from hibernation and enjoying the fresh air. This demure French Woman dresses to impress. She is loving every minute of Spring. Watch her story unfold, one stitch at a time. The most beautiful sight in Spring are the Cherry Blossom trees. When their flowers fall, it is like a beautiful pink snow. Stitch this free pattern in all black, as a silhouette, or be adventurous and add color. Time to shed those winter sweaters and grab your favorite Spring Dress. Dance in the clover with your favorite person. Spring has sprung!